A nice photo of Nablus on Friday, by the talented Ahmad Nimer [@ANimer], photographer from Nablus, who seems to be there every weekend. "We didn't know he was a journalist" + "There was no security concern" — so why detention pending deporation? This story gets better and better [do I have to say, “irony alert“?]. “There was no security concern”, an Israeli official said about the detention since Tuesday in difficult and uncertain conditions of an American journalist who is awaiting a deportation hearing on Sunday — and the deportation that was carried out already of his girlfriend. Continue reading "We didn't know he was a journalist" + "There was no security concern" — so why detention pending deporation? Posted on 15 January 2010 Author Marian HoukCategories Boundaries & Borders, Israel, Journalism and Journalists, Palestine & PalestiniansTags Amira Hass, Area A, Area B, Area C, Ben Gurion Airport, Bethlehem, Fatah, Free Gaza expeditions, Gaza Strip, Hamas, IDF, Israel, Israeli Disengagement from Gaza, Israeli Government Press Office, Israeli Immigration Authority, Jared Malsin, Maan News Agency, occupied Palestinian territory, occupied West Bank, Operation Cast Lead, Oslo Accords, Ramallah, West Bank1 Comment on "We didn't know he was a journalist" + "There was no security concern" — so why detention pending deporation? As settlers continue to take revenge from Palestinians for the murder of an Israeli settler in the West Bank near Nablus last Thursday, after which the Israeli Defense Forces shot three Palestinian men who are members of the Fatah movement headed by Palestinian President Mahmoud Abbas, tensions continue among Palestinians about the measures taken. The implications will echo through the weeks ahead. On the question of the status of the Israeli settlements in the occupied Palestinian territory, I just came upon an interesting opinion piece by international law expert Iain Scobbie (coauthor of “The Israel-Palestine Conflict in International Law: Territorial Issues“), published in the Los Angeles Times on 16 December. “…since its inception, Israel has never claimed legal title to all of the territory of the former British Mandate of Palestine. On the contrary, it has repeatedly denied such a claim in official statements and acts. On May 22, 1948, soon after Israel’s declaration of independence, the country’s representative to the U.N. Security Council stated that its territory was ‘the area outlined in the map appended to the resolution of 29 November 1947, as constituting the area assigned to the Jewish state’ — namely that area accorded to the nascent Israel by the U.N. Partition Plan contained in General Assembly Resolution 181. This did not include the West Bank. The same view was consistently expressed by Israeli courts. In 1950, Israel’s Supreme Court ruled, ‘The territory of the state of Israel does not coincide with all the territory under the former mandate’. Israel thus refused to be seen as the successor state to the Palestinian mandate. Accordingly, it refused to accede to treaties that bound the mandate and refused to pay the public debt that Palestine owed to Britain. How then can there be a right of Israeli settlement in the West Bank, territory to which Israel itself has never made legal claim? … Article 49 [of the Fourth Geneva Convention of 1949, which prohibits the transfer of parts of a state’s population into territory it occupies] prohibits any and all population transfers from the occupying power to occupied territory. In 2004 [in its Advisory Opinion on the Legality of the Construction of a Wall in the occupied Palestinian territory], the International Court of Justice unanimously found that Israeli settlements in the occupied Palestinian territory breached Article 49 … Israel knew soon after the Six-Day War in 1967 that settlements in the occupied territory were illegal. As Gershom Gorenberg recounts in his book, ‘The Accidental Empire: Israel and the Birth of Settlements‘, Theodor Meron, then legal advisor to Israel’s ministry of foreign affairs and a distinguished international lawyer specializing in the law of armed conflict and human rights, advised the Israeli government in September 1967 that settlements in the newly occupied territory were prohibited by Article 49. The fundamental point about settlements, then, is not that they obstruct diplomacy — which they do — but rather that they are illegal. Occupied territory is not under the sovereignty of the occupant. It cannot treat the territory it occupies as it sees fit. An occupant’s powers are circumscribed by international law, which unequivocally prohibits the settlement of part of its population, whether forcible or voluntary, in that territory. While this prohibition arises from Article 49, Article 1 requires parties not merely to respect the terms of the convention in their own conduct but also to ensure that others do. All states are party to the Geneva Conventions, therefore all states have the duty to ensure that Israel’s illegal policy of creating settlements in occupied Palestinian territory ceases without further delay”. This opinion piece can be read in full here. Scobbie provides a link to an English-language translation of Meron’s legal memo, here. Terrible scenes in Sheikh Jarrah, East Jerusalem on Tuesday and Wednesday — ugly clashes between the Israeli settlers who have been given the keys to a small house, and the Palestinian family who built the small house as an addition to their family home and who live on the property. A Palestinian Red Crescent ambulance was called and checked the pushed woman’s her vital signs, before leaving. The settler, incredibly, returned. A Palestinian man, and several young Palestinian boys, shouted to him that he was forbidden to enter, and they pushed him out to the sidewalk. The Israeli police presence has deliberately been kept low, this time, which does reduce general tensions in the area, despite the specific tensions at this now-occupied house. And, the Israeli police that night seemed to be level-headed and mature, by comparison with others who have lost their cool at checkpoints and in similar situations. They arrested the settler who had pushed the Palestinian woman + who then laughed in a gloating way. But, it took them 15 minutes to get the handcuffs on him. 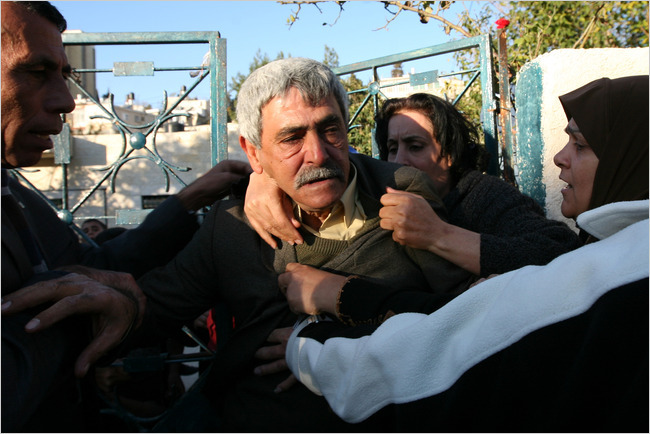 There was no brutality used against the settler — unlike the beatings that were administered by Israeli police and border police to Israelis and international solidarity demonstrators on 2 August when they were protesting the eviction of the Hanoun family from their home up the hill. The Israeli police then arrested the Palestinian man who pushed the settler out when he tried — inexplicably, but apparently triumphantly — to re-enter the newly-occupied house. Two young Jewish women, who were living in one or more of the other nearby occupied houses, and who were wearing in the stereotypical multi-layered settler clothing (trousers with skirts, aprons over sweaters over t-shirts, and rasta-type scarfs tied around their heads and behind their ears), chose just that movment to put their babies into strollers and parade up and down the middle of the street, chatting occasionally with the Israeli border police and other security forces there. Tensions swirled, ebbing and flowing, in that street throughout that afternoon. It was not the moment to take babies outside — unless you were trying to make a dangerous point. In Sheikh Jarrah, a religous-nationalist Jewish group wants to take over some 28 houses (three have already been occupied by settlers) then demolish to make a new large apartment complex for some 200 Jewish families, meaning possibly 1,000 Jewish residents in this small area of East Jerusalem. This is not (as Israeli Prime Minister Benyamin Netanyahu and Jerusalem mayor Nir Barakat are fond of saying) about “the right of Jews to live anywhere” in the former British Mandate of Palestine — it is about armed evictions, backed by Israeli courts and Israeli police and Border Police. It is about the lack of leadership, and the lack of any social safety net or any alternative for the Palestinian refugees being evicted from homes built by the UN for them, that they thought were theirs, and that they lived in all their lives. It is about their possessions being thrown outside. It is about their staying on the sidewalks afterwards, carrying the whole weight of the Palestinian national struggle on their own shoulders, without any real backing or support either from the Palestinian leadership or from their compatriots. It is about families — men, women, and children sitting and eating and sleeping in the baking sun last summer, in the winter rains and cold, in the public view of any passersby, being available to tell their stories over and over again for tour groups of European solidarity types who think that if these Palestinian families only sign one more letter, the world will sit up and take notice — though this hasn’t really happened. It is also about hatred and ugly contempt. The New York Times reported last week that “The small, one-story structure was built about 10 years ago as an extension of the Kurds’ original home, but it was unoccupied, having been sealed by the authorities after it was determined to have been constructed without the proper permits. ‘The authorities took our keys to the property because we built it without permits’, said Nabil al-Kurd, 66, who lives in the original house. ‘But it seems the settlers can live here without permits’…” This NYTimes story can be read in full here. These Sheikh Jarrah houses were built by UNRWA in the mid-1950s on land granted by Jordan, whose troops moved into the area in May 1948, during the fighting that surrounded the creation of the State of Israel. Years after Israel conquered East Jerusalem and the rest of the West Bank in the June 1967 “Six Day War”, Jewish national-religious groups asserted pre-World War One claims to land and homes in the Sheikh Jarrah area — claims that have been supported by the Israeli courts, but for which, Turkish authorities said earlier this year, no supporting documentation could be found after a search through Ottoman Archives. Later that night, I arrived home in time to see the end of Al-Jazeera (original Arabic channel) showing many reports about The Video (of a settler in a Mercedes running over a downed Palestinian who had been shot six times after allegedly stabbing or trying to stab the settler’s wife). The Palestinian was taken to an Israeli hospital (possibly Hadassah in Jerusalem) — which only happens when there is some direct or indirect responsibility for the injury. Almost incredibly, the Palestinian is still alive — but his family, in Hebron, have not been allowed into Jerusalem to visit, and they say they do not have a clear idea about his condition. All over the West Bank, Israeli settlers are resisting efforts of Israeli “Civil Administration” (military) inspectors to enforce the recent decision of Israeli Prime Minister Benyamin Netanyahu and his Defense Minister Ehud Barak (a former Israeli Prime Minister who, as Minister of Defense, is now the effective ruler of the West Bank). And what does the Israeli Prime Minister do about all this? Instead of saying, as a leader should in a situation of such inter-communal tensions (and one of these communities, it should be recalled, is under the occupation of the other) that NO ONE SHOULD TAKE THE LAW [and it is a law whose application generally favors only one of the communities] … NO ONE SHOULD TAKE THE LAW INTO HIS (or HER) OWN HANDS, Netanyahu tries to persuade the settlers that he and they are all “brothers”. The Jerusalem Post reported that “The atmosphere at the Netanyahu meeting was ‘hard and tense’, said Gush Etzion Regional Council head Shaul Goldstein, who said that it was the settlers, rather than Netanyahu, who spoke during the bulk of the meeting. At one point Netanyahu told them, ‘We are not your enemy; we are your brethren’, relayed council head Dani Dayan … ‘We took this difficult decision [a limited 10-month freeze on settlements outside East Jerusalem] in order to move Israel’s widest interests forward’, Netanyahu said during the two-hour meeting … ‘We need to pass through this period together in cooperation … I want you as leaders to hold the steering wheel with us, but there is one thing that is not legitimate. You can protest, demonstrate and express your opinion, but it can’t be that you don’t abide by a decision that was lawfully taken. The real solution is through dialogue and finding solutions during this limited time period‘.” This JPost article can be read in full here. Yossi Sarid has just written, in an article in Haaretz entitled “I have no brother”, this: ” ‘The settlers are our brothers’, Prime Minister Netanyahu said this week, trying to convey their holy wrath. But let me make it clear: They are not my brothers. I don’t have any brothers like that, or sisters … When I see a Jew running over a wounded Arab terrorist again and again, I am absolutely certain that any connection between us is coincidental, happenstance, and that I’m obligated to sever it completely. I have to save my human image before I, too, am run over by that silver Mercedes. And when I see Jews expelling Palestinians from their homes in the East Jerusalem neighborhood of Sheikh Jarrah – evicting and taking over, getting into warm beds that haven’t even had a chance to cool, leaving entire families in the cold – I am filled with disgust”. This piece by Yossi Sarid can be read in full here. UPDATE: Uri Avnery has just written in his article today, which he entitled “kkkitsch”, that: “Israel is a far from monolithic society. It is a vibrant, fermenting mix, with many tendencies, from the extreme Right to the extreme Left. At present we have a government of the extreme right, but there is also a peace camp. There are soldiers who refuse to remove settlements, but there are also soldiers who refuse to guard settlements. Quite a number of people devote their time and energy to the struggle against the occupation, sometimes exposing themselves to physical danger in the process … The Netanyahu government has paid lip-service to the Two-State principle and is violating it every day. It has rejected a full freeze of settlement activity in the territories, the very territories which all governments – including the German one – agree should become the State of Palestine. It is building at a crazy pace in East Jerusalem which – even according to the German government – must become the capital of Palestine. It is carrying out in Jerusalem something which comes very close to ethnic cleansing. Should Ms. Merkel hug this government and smother its face with kisses?” – Avnery asks, on the eve of an important European Union meeting about their position on Jerusalem. Palestinian President Mahmoud Abbas started the legal procedure, in Ramallah today, for presidential and legislative elections to take place in three months’ time, on 24 January 2010. In the announcement, Abbas said that the elections would take place in the West Bank, in East Jerusalem, and in the Gaza Strip which has been controlled by Hamas since the rout of Fatah/Palestinian Preventive Security Forces there in mid-June 2007. Hamas spokespersons denounced Abbas’ announcement. “Donor countries will have to keep giving large amounts of aid to the Palestinian government in the foreseeable future, unless Israel eases access of Palestinian goods to Israeli and world markets, the World Bank said in a report Friday”, according to a story published by Israel’s YNet on Friday. YNEt added that “The warning came ahead of a meeting of representatives of donor countries next week in New York, on the sidelines of the UN General Assembly. The donors are to review their aid scheme, which is based on the assumption that injecting large funds into the Palestinian territories will boost the economy and make the Palestinians gradually less dependent on aid. Donor countries have given billions of dollars to the Palestinians since 1993, in an attempt to prop up an economy battered by conflict with Israel and severe Israeli restrictions on Palestinian trade and movement … [T]he West Bank and Gaza, on either side of Israel, remain cut off from each other. Palestinian exports from the West Bank are hampered by slow movement of goods through Israeli-controlled crossings into Israel or Jordan. The Abbas government is still short of money, the bank said, citing a $400 million financing gap for this year. The government’s net revenues were more than 15 percent below target in the first half of 2009, the report said”. The YNet story can be read in full here. Jeff Halper: "Dismantling the 'Matrix of Control' "
“Almost a decade ago I wrote an article describing Israel’s “matrix of control” over the Occupied Palestinian Territories. It consisted then of three interlocking systems: military administration of much of the West Bank and incessant army and air force intrusions elsewhere; a skein of “facts on the ground,” notably settlements in the West Bank, Gaza and East Jerusalem, but also bypass roads connecting the settlements to Israel proper; and administrative measures like house demolitions and deportations. I argued in 2000 that unless this matrix was dismantled, the occupation would not be ended and a two-state solution could not be achieved. Since then the occupation has grown immeasurably stronger and more entrenched. Indeed, the matrix has reconfigured the country to such an extent that today it seems impossible to detach a truly sovereign and viable Palestinian state from an Israel that has expanded all the way to the Jordan River. Anyone familiar with Israel’s “facts on the ground,” perhaps first and foremost the settlers, would reach the conclusion that, in fact, the matrix cannot be taken apart in a piecemeal fashion, leaving a few settlements here, a road there and an Israel “greater” Jerusalem in the middle. The matrix has become far too intricate. Dismantling it piece by piece, with Israel stalling by arguing for the security function of each “fact on the ground,” would be a frustrating series of confrontations that would eventually exhaust itself. The only way to a genuine two-state solution and not a cosmetic form of apartheid is to cut the Gordian knot. The international community, led by the United States, must tell Israel that the occupation must be ended entirely. Israel must leave every inch of the Occupied Territories. Period. And now, at this critical juncture, as the two-state solution for the Israeli-Palestinian impasse disappears under the weight of Israeli settlements, there is a great imponderable: Is President Barack Obama genuinely serious about reaching such a solution or is he merely going through the motions familiar from previous administrations? Since the Cairo speech, however, fundamental doubts about US efforts have resurfaced. The only demand made by Obama upon Israel has been for a settlement “freeze,” a welcome symbolic gesture, to be sure, yet irrelevant to any peace process. Israel has enough settlement-cities in strategic “blocs” that it could in fact freeze all construction without compromising its control over the West Bank and “greater” Jerusalem, the Arab areas to the north, south and east of the city where Israel has planted its flag. Focusing on this one issue — which, months later, is still being haggled over — has provided Israel with a smokescreen behind which it can actively and freely pursue more significant and urgent construction that, when completed, will truly render the occupation irreversible. It is rushing to complete the separation barrier, which is already being presented as the new border, replacing the “Green Line,” the pre-June 1967 boundary to which Israel is supposed to withdraw, by the terms of UN Security Council resolutions, but on which even the most ardent two-staters have long since given up. Israel is demolishing homes, expelling Palestinian residents and permitting Jewish settlement throughout East Jerusalem, measurably advancing the “judaization” of the city. It is confiscating vast tracts of land in the West Bank and “greater” Jerusalem and pouring bypass road asphalt at a feverish pace so as to permanently redraw the map. It is laying track on Palestinian land for a light-rail line connecting the West Bank settlement-city of Pisgat Ze’ev to Israel. It is drying up the main agricultural areas of the West Bank, forcing thousands of people off their lands, while instituting visa restrictions that either keep visiting Palestinians and internationals out of the country altogether, or limit their movement to the truncated Palestinian enclaves of the West Bank. ‘Quiet’, behind-the-scenes diplomacy is surely taking place, but the few details that have emerged are far from reassuring. The State Department has mocked as “fiction” a ten-point document given to the Arab press by Fatah figure Hasan Khreisheh that promises an “international presence” in parts of the West Bank and US backing for a Palestinian state by 2011. The component of this alleged plan that seems more likely is that the US wants a partial freeze on settlement activity from Israel in exchange for a pledge from Washington to push for more stringent sanctions upon Iran for its nuclear research. On August 25, the Guardian quoted ‘an official close to the negotiations’ saying: ‘The message is: Iran is an existential threat to Israel; settlements are not’. Why, then, leave these massive settlements intact? The argument is that their residents would object to the point of a civil war in Israel. This is patent nonsense. True, these settlement blocs contain 85 percent of Israelis living in the Occupied Territories, but these are not the ideological settlers who claim the entire Land of Israel from the Mediterranean Sea to the Jordan River. Instead, they are “normal” Israelis who have been attracted to the settlements by high-quality, affordable housing. They would have no objection to resettling inside Israel on the condition that their living standards do not fall, while the Israeli economy, assisted by international donors, would have no problem footing the bill for this population, about 200,000 in number. Settlements in ‘greater’ Jerusalem, housing another 190,000 Israeli Jews, present no problem whatsoever. Residents are free to stay where they are in a shared and integrated Jerusalem. As for the “ideological” settlers of the West Bank, only about 40,000 in number (out of almost six million Jews altogether), they can easily be relocated inside Israel, just as were their counterparts in Gaza. Their relocation will be a test of international assertiveness, of course, because the settlers are able to mobilize the support of the right-wing parties in Israel. Since Israel can make no cogent argument as to the security necessity of these tiny settlements, however, internal opposition will simply have to be overruled; the international community cannot allow such frivolous ideological matters to destabilize the entire global system. If the legitimate concerns of the Israeli public over its security are addressed by the international community, which they can be, there is no compelling reason why Israel should not return to the pre-June 1967 border. In fact, if the Gaza episode indicates anything, it is that the Israeli public is willing to remove settlements if it is convinced that doing so will enhance its security. Reminding Israelis that leaving every inch of the Occupied Territories will still leave them sovereign over a full 78 percent of the country — not a bad deal for what will soon become a minority Jewish population — should seal the deal. The Obama platform, should it see the light of day, will probably also adopt the Israeli position that Palestinian refugees can only be repatriated to the Palestinian state itself, not to their former homes inside Israel. This plank would place a weighty economic burden on that tiny prospective state, since the refugees are, by and large, a traumatized and impoverished population with minimal education and professional skills. Add to that another significant fact: Some 60 percent of the Palestinian population is under the age of 18. A Palestinian state without the ability to employ its people and offer a future to its youth is simply a prison-state. Now the need for a viable Palestinian state is recognized and embodied in the ‘road map’, the peace initiative propagated by President George W. Bush in 2003, and will probably be acknowledged in a plan from Obama as well. Despite its limited size, a RAND Corporation study concluded that such a state is possible, but only if it controls its territory, borders, resources and movement of people and goods. Israel must be made to understand that while it will remain the hegemonic power in the region, its own long-term security depends upon the economic wellbeing of its Palestinian neighbors. Eighty percent of the Palestinians are refugees, and half of the Palestinians still live in refugee camps within and around their homeland. Any sustainable peace is dependent upon the just resolution of the refugee issue. Technically, resolving the refugee issue is not especially difficult. The Palestinian negotiators, backed up by the Arab League, have agreed to a “package,” to be mutually agreed upon by Israel and the Palestinians, involving a combination of repatriation in Israel and the Palestinian state, resettlement elsewhere and compensation. The “package” must contain, however, two other elements, without which the issue will not be resolved and reconciliation cannot take place. First, Israel must acknowledge the refugees’ right of return; a resolution of the issue cannot depend solely on humanitarian gestures. And Israel must acknowledge its responsibility for driving the refugees from their country. Just as Jews expected Germany to accept responsibility for what it did in the Holocaust (and Israelis criticized the Pope during his summer 2009 visit for not apologizing enough), just as China and South Korea will not close the book on World War II until Japan acknowledges its war crimes, so, too, will the refugee issue continue to fester and frustrate attempts to bring peace to the region until Israel admits its role and asks forgiveness. Genuine peacemaking cannot be confined to technical solutions alone; it must also deal with the wounds caused by the conflict. Jeff Halper first posted this article on ZNet, here. Posted on 13 September 2009 Author Marian HoukCategories Boundaries & Borders, Human Rights, Israel, Middle East Peace Process, Negotiators and negotiations, NGOs, Palestine & PalestiniansTags Dismantling the Matrix of Control, Israel, Jeff Halper, occupied Palestinian territory, The Matrix of Control, U.S. President Barak Obama, West BankLeave a comment on Jeff Halper: "Dismantling the 'Matrix of Control' "
Alarmed Israeli experts are using unusually strong language in warnings about their government’s authorizations this week for settlement activities in the occupied West Bank and in East Jerusalem — and about the possible consequences. U.S. and world leaders interested in peace and stability in the Middle East — which President Barack Obama has said is an American strategic interest – should take note. But reaction has been very slow in coming. Palestinian officials, meanwhile, are busy with internal feuding and possible reconciliation, and are distracted by exhaustion just over half-way through the special month of Ramadan with its total prohibitions (in public, at least) on activities such as eating, drinking (including water), and smoking for some 14 hours a day (from two hours before dawn until sunset). Palestinian officials are also keeping relatively quiet because they do not want to jeopardize President Mahmoud Abbas’s forthcoming visit to the high-level segment of the annual UN General Assembly debate in about ten days’ time, with its planned whirlwind of formal and informal diplomatic meetings with the world’s top leaders, including the head of state of the UN’s host county, U.S. President Barack Obama. In addition, Palestinian officials generally tend to believe that these problems are really not so much theirs, as the responsibility of the international community. But, Akiva Eldar reports in Haaretz today that “Three days after the U.S. administration criticized the decision of Prime Minister Benjamin Netanyahu to authorize the construction of hundreds of new housing units in settlements, the Israel Lands Administration published tenders for the construction of 486 apartments in the neighborhood of Pisgat Ze’ev in East Jerusalem”. To call the U.S. reaction to the moves that started on Monday — the Labor Day holiday in the States, when all of official Washington was taking time off — “criticism” may be a slight exaggeration. As Akiva Eldar notes in the last sentence of his piece, “a source familiar with the exchanges between Israel and the U.S. on the issue of a settlement freeze told Haaretz that the Obama administration is not interested in a crisis with the government of Netanyahu on settlements“. It might be understandable that nobody wants a “crisis” — but crisis might well be what they will get if this issue is fobbed off once again. There has been a concentrated surge in Israeli settlement activity in and around East Jerusalem since the end of the three-week massive Israeli military attack on Gaza, Operation Cast Lead, from 27 December to 18 January. According to Akiva Eldar, “The new construction project is designated for the outer edge of the northeastern municipal boundary of Jerusalem, and will narrow the distance between the homes on the edge of the neighborhood and the nearby Palestinian communities. Bids have been solicited for construction on an overall area of 138 dunams (about 34 acres), which was subdivided into 25 smaller tenders. The Obama administration has made it clear on a number of occasions that it is demanding that Israel freeze settlement construction in the territories, including in East Jerusalem. Two months ago, it was reported that Netanyahu had ordered a delay in the publication of the tenders”. Eldar also reported that “Daniel Seidemann, the founder of Ir Amim, a non-profit organization that seeks to promote coexistence in Jerusalem, said last night that tenders of such magnitude would not be announced if they did not have the support of the prime minister. Seidemann describes the bid-taking as yet another example of a fraud that leads to creating facts on the ground even though there is talk of a freeze in settlement construction”. Eldar’s story can be read in full here. Seidemann was the founder and is now the legal adviser of Ir Amim, or *City of Nations” — an organization that is devoted to developing a politically-sustainable future for a Jerusalem that will be equitably shared between its two peoples and three religions. Jerusalem, one of the most segregated cities in the region, is Israel’s declared capital (a move that was made in 1980 but which is not “recognized” diplomatically by almost every country in the world) and its largest — and poorest — city. East Jerusalem, which did not become part of Israel at the time of its state creation in May 1948, is where almost all of the city’s Palestinian residents (who are overwhelmingly not Israeli citizens) live. However, there are now large areas (“neighborhoods”) of Jewish settlement in East Jerusalem. The Palestinian declaration in 1988 (made in Algiers by Yasser Arafat, then endorsed by the full Palestine National Council) claimed East Jerusalem as the capital of a future independent Palestinian state — a position that the most of the world, including the U.S. Administration. has until now appeared to endorse. * As of today, about 2,000 settlers live in Palestinian neighborhoods in East Jerusalem. * In recent months, the settlement process in Palestinian neighborhoods in East Jerusalem has accelerated – in the area that is at the heart of the Israeli-Palestinian conflict. The plans are meant to establish Jewish residential contiguity in the neighborhoods surrounding the Old City, and place settlers in the heart of the Muslim and Christian quarters of the Old City, in Silwan and Sheikh Jarrah. * These settlements are part of a strategic process, coordinated and advanced by various governmental authorities and the Municipality of Jerusalem. … [And] in the first half of 2009 plans to build 150 additional residential units in East Jerusalem were advanced. These would be able to house about 750 additional settlers in strategic sites in the eastern part of the city. Moreover, plans were advanced to build public Jewish structures like synagogues, mikvot, and community centers in these sensitive areas. The report notes that the majority of the building is carried out by private bodies, and [settler] associations like ‘Elad’ and ‘Ateret Cohenim’. However, it is clear that these activities are part of a strategic plan conceptualized, coordinated, and advanced by various government agencies, as well as by the Municipality of Jerusalem. The latter’s role includes support of the accelerated processes in approving settlement plans; and ‘vigilance’ in demolishing homes in these neighborhoods. In the report’s appendix, other processes likely to influence the state of the Israeli-Palestinian conflict are tracked, especially the expansion of Israeli construction in East Jerusalem and the demolition of Palestinian homes. The appendix notes reports of land acquisitions in Samir Amis — in northern Jerusalem on the other side of the separation fence [n.b., Semiramis is also on the other side of what Israeli military officials call a “border crossing”, the Qalandia checkpoint] — in Beit Hanina, in Jabel Mukaber, in the Muslim quarter, as well as in other areas”. 1. The accelerated process of Israeli settlement in Palestinian communities in East Jerusalem. 2. Plans for development of E-1, which would prevent future development of a Palestinian capital to the east, and sever its connection with the West Bank. Jerusalem; and to isolate a number of Palestinian communities”. The report also states that “Recent months have seen the acceleration of the process of Israeli settlement in Palestinian communities in East Jerusalem. These settlements create a crescent of Jewish population along the ridges surrounding the Old City, and implant Jewish population in the midst of the Muslim and Christian Quarters, as well as in Silwan and Sheikh Jarrah – precisely in the areas of most intense dispute in the Palestinian /Israeli conflict. At the start of 2009 approximately 2000 Israeli settlers were living in Palestinian neighborhoods of East Jerusalem – primarily in the historic area. In the first half of 2009, plans are being advanced for the building of an additional 150 housing units that could settle another 750 people in strategic areas of disputed East Jerusalem. In addition, plans were advanced for Jewish community facilities (e.g., synagogues, community centers, ritual baths, etc.) in these areas. Most of this activity is executed by private bodies, such as the Elad and Ateret Cohanim associations. However, it is evident that individual settlements are part of a strategic move, coordinated and facilitated by national governmental units, as well as by the Jerusalem Municipality. The latter’s contribution is manifested in expedition of planning processes and increased ‘vigilance’ regarding housing demolitions in the affected communities. Of special concern are the recently exposed plans for a massive expansion of settlements in Ras Al-Amud and Silwan, as well as the approval of plans for construction in Sheikh Jarrah and attendant evictions … A number of reports have appeared in the Israeli press about land purchases by settler organizations in various Palestinian neighborhoods. Ir Amim understands that there have been undisclosed purchases in Samiramis (north of the Separation Barrier, but within the Jerusalem municipal lines), Beit Hanina, Jabel Mukaber, and the Muslim Quarter of the Old City … According to the Municipality of Jerusalem, in the first six months of 2009, 40 Palestinian structures were demolished, including 15 which were demolished by the owners. This number is roughly representative of the average number of demolitions carried out in half a year in past years (i.e., 42 homes). Over the years 2004 – 2008, an average of 84 Palestinian homes were demolished in Jerusalem yearly. In 2008, 88 homes were demolished. In this half-year period, demolitions occurred in virtually all of the Palestinian neighborhoods of Jerusalem, including 5 in the Old City. It is notable that in the entire year of 2008, only 3 homes were demolished in the Old City”. The full Ir Amim report in English can be viewed here . Shaul Arieli, a military aide to then-Prime Minister Ehud Barak at the time of the Camp David negotiations conducted with the Palestinians under the auspices of former U.S. President Bill Clinton in the year 2000, has just published on his website a dramatic power point presentation of the extensive Israeli preparations to develop the “E-1 envelope” in the West Bank half way between East Jerusalem and Dead Sea, opposite the very large Israeli settlement Maale Adumim, which is just south of the main Road One (1). Arieli’s photographs and explanations show massive Israeli infrastructure development of a new area designated as “Mevasseret Adumim”, on the northern side of the main highway to the Dead Sea, Road One (1), where now there is only the recently-relocated Police Station (moved from the East Jerusalem area of Ras al-Amud earlier this year, despite straight-faced statements of Israeli officials last year to then-U.S. Secretary of State Condoleezza Rice that the police station move would not take place in the near future). Arieli, who is now a member of Israel’s Council on Peace and Security, an independent organization of former military and other officials, later developed the maps and the 1:1 land swap proposal that were an important part of the Geneva Initiative — a proposal for a conclusion of Israeli-Palestinian final status negotiations that was launched with Swiss support in December 2003 by “civil society” (critics, however, called them has-been and wanna-be politicians). The 1:1 land swap was a feature of the reported offer (details are only very sketchy) that was apparently made by Israel’s outgoing Prime Minister Ehud Olmert to Palestinian President Mahmoud Abbas last year. In his powerpoint presentation, Arieli concludes that “the strategic consequences [of Israeli settlement development in the West Bank] are alarming. Israel continues to invest in the [E-1] plan as if no final status negotiations are taking place, or as if it does not treat the negotiations with the seriousness needed to conclude an agreement. It continues to position itself in the West Bank, including entrenching the settlement enterprise under an apparent work assumption that the conflict would continue … On the one hand, Israel is negotiating over final status … on the other hand, it is investing heavily in creating reality that eliminates the ability to reach such an agreement. Either the government is knowingly wasting the taxpayer’s money, or is purposefully undermining the ability to conclude a final status agreement”. Arieli’s powerpoint presentation, with its photos and maps, can be viewed here . “At the end of 2008, the West Bank (not including East Jerusalem) contained 121 settlements that the Interior Ministry recognized as ‘communities’, even though some of them contain stretches of land on which the built-up area is not contiguous. Twelve other large settlements and small settlement points are located on land annexed by Israel in 1967 and made part of Jerusalem. There are an additional 100 or so unrecognized settlements, referred to in the media as “outposts,” which are usually smaller than the recognized settlements. By the end of 2008, the number of settlers in the West Bank stood at 479,500. This figure is based on two components: according to Israel´s Central Bureau of Statistics (CBS), in 2008, 285,800 settlers were living in the West Bank, excluding East. In addition, based on growth statistics for the entire population of Jerusalem, the settler population in East Jerusalem at the end of 2008 is estimated at 193,700. According to CBS´s estimate, in 2008, the settler population (excluding East Jerusalem) grew at a much faster rate than the general population: 4.7 percent compared to 1.6 percent respectively [And] In 2007, the population of the settlements (excluding East Jerusalem) grew faster than Israel´s general population: 4.5 percent compared to 1.5 percent”. This information can be examined in full here. * Unfairly dividing the budget between the two parts of the city, with harmful effects on infrastructure and services in East Jerusalem. Israel´s policy gravely infringes the rights of residents of East Jerusalem and flagrantly breaches international law. East Jerusalem is occupied territory. Therefore, it is subject, as is the rest of the West Bank, to the provisions of international humanitarian law that relate to occupied territory. The annexation of East Jerusalem breaches international law, which prohibits unilateral annexation”. This can be studied on the BTselem website here. “Between 1948 and June of 1967, Jerusalem was divided in two: West Jerusalem, which covered an area of about 38 square kilometers was under Israeli control, and East Jerusalem, which contained an area of some 6 sq. km [n.b., this refers just to the Old City, which is all there was of East Jerusalem until Israeli unilateral annexation of suburban areas in 1967 created Greater Municipal Jerusalem, an area over which Israel formally extended, at that time, its administration and law], was ruled by Jordan. In June 1967, following the 1967 War, Israel annexed some 70 sq. km to the municipal boundaries of West Jerusalem, and imposed Israeli law there. These annexed territories included not only the part of Jerusalem that had been under Jordanian rule, but also an additional 64 square kilometers, most of which had belonged to 28 villages in the West Bank, and part of which belonged to the municipalities of Bethlehem and Beit Jala. Following their annexation, the area of West Jerusalem tripled, and Jerusalem became the largest city in Israel. Prior to 1967, therefore, most of the area comprising present-day Jerusalem was not part of the city (West or East), but rather part of the West Bank. The new borders, set by a committee headed by General Rehavam Ze’evi, then assistant to the head of the Operations Branch of the Israel Defense Forces’ General Staff, were approved by Israel’s government”. This information can be viewed on the BTselem website here. “E1 (derived from ‘East 1’) is the term applied by the Israeli Ministry of Housing to a planned new neighbourhood within the municipal borders of the large Israeli settlement of Ma’aleh Adumim (30,000+ residents), linking it to the municipal boundary of Jerusalem (a unilateral Israeli line well east of the Green Line). E1, along with a maximalist barrier around Ma’ale Adumim, would complete the encircling of East Jerusalem and cut the West Bank into two parts, and further restrict access into and out of Jerusalem. The economic prospects of the Wset Bank (where GDP is under $1000 a year) are highly dependent on access to East Jerusalem (where GDP is around $3500 a year). [n.b. – In Israel in 2005, the GDP may have been around $18,000 per year, and it is now more like $24,000 per year] Estimates of the contribution made by East Jerusalem to the Palestinian economy as a whole vary between a quarter and a third. From an economic perspective, the viability of a Palestinian state depends to a great extent on the preservation of organic links between East Jerusalem, Ramallah and Bethlehem. “E1 is an old plan which was drawn up by Rabin’s government in 1994 but never implemented. The plan was revived by the housing Ministry in 2003, and preliminary construction in the E1 area began in 2004. Since his resignation from the Cabinet, Netanyahu has tried to make E1 a campaign issue. §	commercial areas, hotels and ‘special housing’, universities and ‘special projects’, a cemetery and a waste disposal site. §	About 75% of the plan’s total area is earmarked for a park that will surround all these components. §	So far only the plans for the economic development zone have received the necessary authorisations for building to commence. The plans related to residential areas and the building of the Police Headquarters have been approved by the Ma’aleh Adumim Municipality but not yet by the Civil Administration’s Planning Council. “The current built-up area of Ma’aleh Adumim covers only 15% of the planned area. The overall plan for Ma’aleh Adumim, including E1, covers an area of at least 53 square kilometres (larger than Tel Aviv) stretching from Jerusalem to Jericho (comment: Israel’s defence of settlement expansion ‘within existing settlement boundaries’ therefore covers a potentially huge area). In August 2005 Israel published land requisition orders for construction of the barrier around the southern edge of the Adumim bloc, following the route approved by the Israeli cabinet on 20 February 2005 (including most of the municipal area of Ma’aleh Adumim). The E1 project would cut across the main central traffic route for Palestinians travelling from Bethlehem to Ramallah. This route is actually an alternative to route 60, which until 2001 was the main north-south highway connecting the major Palestinian cities (Jenin, Nablus, Ramallah, Jerusalem, Bethlehem and Hebron) on the ridge of mountains in the West Bank. And Palestinians currently have only restricted access to route 60 (either permits are required for certain segments or roads are blocked), especially from/to the Jerusalem area. “Since 2003, some preparatory work has taken place. In the northern sector of E-1, where residential housing is planned, the top of a hill has been levelled in order to allow construction. In the southern section, where a police station and hotels are planned, an unpaved road has been constructed. But no further work has been carried out for over a year. On 25 August 2005 Israel announced plans to build the new police headquarters for the West Bank in E1, transferring it from its present location in East Jerusalem. Many previous settlements have started with a police station, and we are aware from Israeli NGOs that Israel has plans to convert the existing West Bank police headquarters, in Ras Al-Amud, into further settlement housing”. This 2005 EU document — which was never officially adopted — can be viewed in full here on the Electronic Intifada website. For the first time ever,maybe, Israeli flags are flying from the lamp posts in the West Bank along the Palestinian Road 60, from just outside the settlement of Adam up to the illegal outpost of Migron. They were put there to mark celebrations for Israel’s 61st Independence Day, just the way they were put on the streets of Jerusalem and elsewhere inside Israel proper. But these flags are is in the middle of the West Bank. Yesterday, Israeli flags were put on the lamp posts at the interchange between Road 60 and the road going to the Beit El settlement (or to the Beit El military courts and civil administration offices — or to the Beit El DCO checkpoint, where diplomats, staff members of international organizations, journalists, and Palestinian VIPs can pass through. It’s a much longer route in and out of Ramallah, but it’s much more serene, and less stressful, and a much more scenic route, than going through the awful Qalandia checkpoint). These Israeli flags I’m writing about in this post are not to mark Israeli checkpoints or military bases. They were put on lampposts, as if it’s a perfectly normal thing to do, deep inside what is internationally recognized as occupied territory.